Going fat doesn’t have to mean going heavy. If you prefer wide skis (e.g. DPS 112s) and aren’t competing on the freeride world tour, the Plum Yak will take you to your happy place. Lightest in category, the touring binding features an extra-wide mounting pattern and a built-in heel-support pad. These give you the confidence to put powder boards on edge or drop from pillow to pillow. Suitable for skis at least 95mm in girth underfoot, the Yak optionally comes with integrated rear brakes. The new brake design has a clever ski/walk mode switch designed to eliminate accidental deployment when touring. The Plum Yak is the default choice for powder addicts that like to do several laps and prefer to surf on top with mini-snowboards. Wide base plates add mounting stability and help transfer power to edges of bigger skis. Fully-adjustable lateral and vertical release values range from 5.5 to 12 on the tech scale. Built-in heel support pads reduce stress on the heel pins and add comfort to landings. 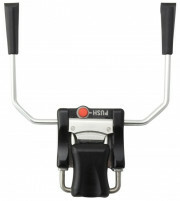 Two riser positions and a flat mode are enabled by rotating the heel, optionally with a pole. 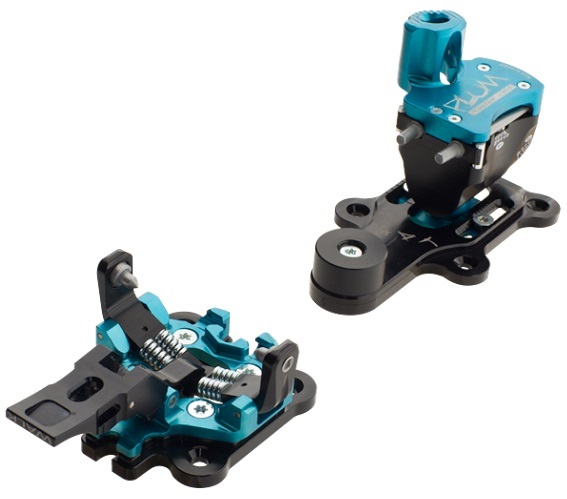 Optional brake is integrated into the heel baseplate and can be locked for skinning. Aerospace-grade aluminum toes and heel roofs provide everyday strength to the design. Crampon receptors are integrated into the toe and can accept Plum crampons from the top. Adjustment rails in the heel have a 30mm range, even in the version with the brake. Toe plate reduces the ramp angle in the binding, allowing a more neutral stance. Made in France, with love, by French people and/or immigrants. What is the height of the heel pad above the ski (i.e. the round thing that acts as a heel riser located in front of the heel pins)? I'm interested in pairing this with the G3 ION toe, so am assuming that this would help make the ramp angle more neutral when compared to other lightweight heel options. Also, I'm assuming that the listed weight for the Plum Yak heel piece (293 g) is for the pair. Is it? Hi Yann! The height of that heel pad is 22.5mm and the heel pieces weigh 293g each. I was wondering if you have seen any Plum Yak toe pieces break, similar to the Guide issues that they had a few years back? Been on the yak for the pass three years, and have to say I have been super pleased with them. In search of a tech binding for a lighter weight setup, I initially started looking at the Guide. Issues with prior generations had me concerned. It appears that the toe piece has been addressed, correct? Lastly, the plum yak base plate work with the Guide toe creating a flatter ramp angle? In this case, you would drill for yak hole pattern 50x50 for the toe? Interested in this setup on a Salomon Mtn Explore 95, any idea if this work? Regarding the binding retention plate, etc? Hi Adam, the Guide and Yak toes are essentially the same, and yes, you can put the yak plates under the Guide toes and drill the Yak pattern. No problems with either binding on the Salomon. Hi Zachary, unfortunately those aren't sold separately as the they are integrated into the newer heel plates. When do the plum yak bindings w rear brake ship? Site says available for pre-order. Hi Tom, we expect these within a week to 10 days.